I was banned from my local Subway sandwich shop. I’ll attempt to recreate a transcript of the events and perhaps someone can explain to me where things went wrong. Me: So, uhhh. How ’bout those sandwiches? Looks like you’ve got some bread back there. Let’s cut open some Italian Herbs and Cheese and get a foot long oven-roasted chicken breast going. Subway Employee: <cuts wrong bread> What sandwich did you want? Me: Apparently chicken breast on wheat. Throw on some provolone and we’ll call it even. Subway Employee: Would you like it toasted? Me: Of course I want it toasted. I’m not an animal. Subway Employee: <buries hand in lettuce> Any veggies? Me: If I wanted lettuce scraps I’d go back to Africa. Let’s do a thin layer of spinach and some tomatoes. Me: Why in god’s name would you think it’s appropriate to put six tomatoes on a foot long sub? And why do you only have the end pieces? Let’s do another dusting of tomatoes. Me: Okay, let’s try some pickles. So we’re doing this again? You keep putting pickles on this sandwich until I hear you scraping the bottom of the bin. Me: Banana peppers and for the love of god if you put just six on there I will make you watch me flush this sandwich down the toilet. Me: I’d like some onions. Me: Alright. We’ve had a rocky relationship, but I think we can make it if you get this right. I want some of the sweet onion sauce. I want to be able to hold this sandwich. You decide the appropriate amount. Me: I’m going to use all of my future birthday wishes on you getting cancer. Remember to follow me on Twitter. I will do whatever you want if you follow me on Twitter. There’s a Facebook page too. Vandalize it. Get updates. Whatever. Here’s the review. Appearance: Pretty clear for a hefeweizen. The head is thick and clingy, dropping gorgeous laces down the side of the glass. The beer itself, pale straw with little by way of carbonation. Not particularly remarkable, but it maintains a certain indescribable allure. I’d try to describe it, but then I couldn’t really call it indescribable. Smell: Like the rolled up sleeves of an angsty teen, this beer is full of cloves. Lots of spiceyness, a bit of honey, and the tiniest bit of tropical fruit. There’s some wheat in there too. Taste: It hits the palate very gently. A sharp sting of carbonation falls to that wonderful spiciness that defined the aroma. Banana is pronounced, and pairs well with a tame wheat taste. It’s got a nice creaminess and yet somehow remains crisp. A lingering carbonation keeps the taste buds stimulated while the wheat in the aftertaste takes you home. This was a master class in mouthfeel. Overall: This was a very enjoyable experience. Wheat beers are a weakness, and this delivered. 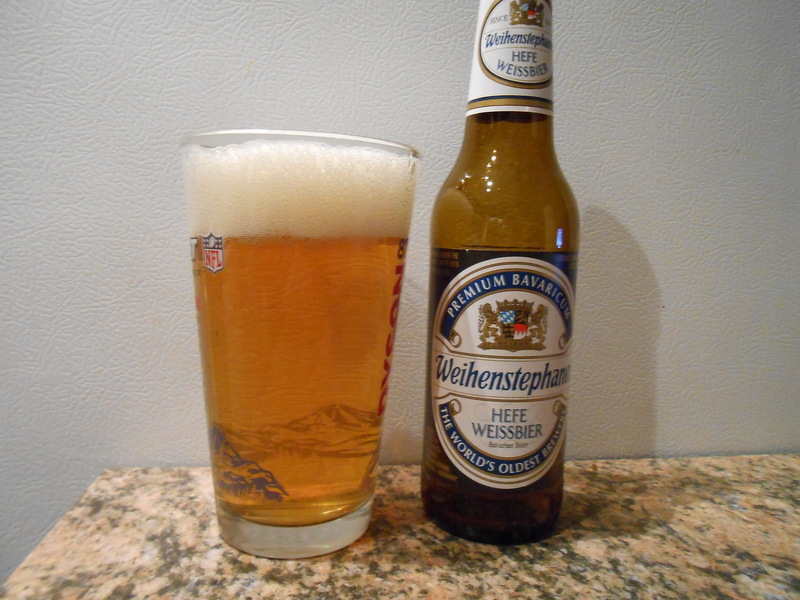 I honestly prefer the Franzikaner Weissbeer from my very first review, but this is still a great time. Weinhenstephaner is the oldest brewery in the world, and with this kind of product I can understand why they’ve been able to stay open so long. 85/100.